As new players four years ago, my wife and I had created our own version of two player Mah Jongg, but it always seemed that by the middle of the game we were each just waiting to see who would draw the Mahj tile. Then Siamese Mah Jongg appeared; we learned it from the website and have been playing it ever since. We taught our friends who now rarely play traditional Mah Jongg. In fact, our local group here near LA has evolved into a monthly Royale tournament. Beginning with the 2017 Mah Jongg Madness Tournament in Las Vegas, and at three subsequent national tournaments, I have run increasingly popular Siamese Mini-Tournaments. With the help of other Siamese Mah Jongg players, we have created standard guidelines for conducting Siamese Mah Jongg Tournaments that are being used nationwide. In 2017, I founded the Siamese Mah Jongg Guild on Facebook. A place to share our experiences, make connections, and celebrate our cumulative knowledge, the Guild now boasts close to 1,000 members. We have files on many aspects of the games and lively discussions of the issues that emerge as more people discover the subtleties of the game. We also encourage experimentation. For example, our local group decided to see what would happen if we played with six players and three sets of tiles. We spent a morning at the Simi Valley Senior Center trying to solve the problems of actually reaching the tiles on such a large table. What we discovered was that playing with six was a party game rather than a winner-take-all proposition. We posted the results on the Guild page. All of these experiences have taught me a few things about the game. Along with the familiar strategies used in traditional Mah Jongg, the Siamese games add a few new aspects. For example, playing both hands that require the same tiles causes problems. Deciding when to expose a Mahj and make your jokers dead or wait for a double Mahj is another consideration. On the other hand, SMJ gives you more freedom to explore hands that you rarely get to play. Singles and Pairs hands are much more possible because you have so many tiles from which to build, as is the 2018 “Big Hand.” More importantly, SMJ builds skills faster than traditional MJ because you are playing twice as many games in the same time period. For the past fifteen years, photographer John Davis has built a reputation for his unique blend of digital technology and cultural references. He has worked with a variety of clients including the Friends of the Urban Forest, the August Wilson Center for African American Culture, Public Broadcasting System television station WQED, Carnegie Magazine, Carnegie Library, and the Carnegie Natural History Museum in Pittsburgh. He has also produced CD covers and promotional material for country bands in Western Pennsylvania, and his work is collected at the global headquarters of the Pittsburgh Plate Glass Industries in Pittsburgh. He is recently the winner of the online Better Photo Contest, placing first in over 5,800 entries and has won honorable mention in the International Photography Competition’s architectural division. Now located in the Los Angeles area, he has begun a long-term project called Mahj on My Mind. 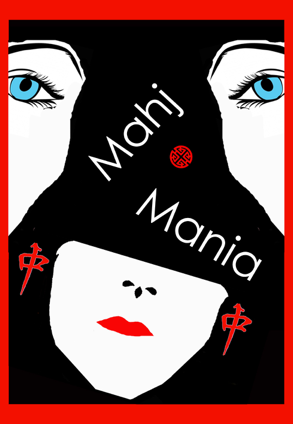 His unique Mahj-Art combines cultural and aesthetic references with elements of the popular game of American Mah Jongg. John Davis was invited to show his work in February, 2016, at the National Mah Jongg Madness Tournament in Las Vegas, the largest of its kind in the nation with over 400 participants. Since then, he has gained a nationwide audience for his Mahj-Art, with sales of his fine art prints to collectors, mahj players, and tournament directors. In the Los Angeles area, he regularly sells at mah jongg tournaments and supports fundraising efforts by donating his Mahj-Art for raffles and tournament prizes. His success at these monthly tournaments has created a local audience that collects his work and commissions Mahj-Art pieces.